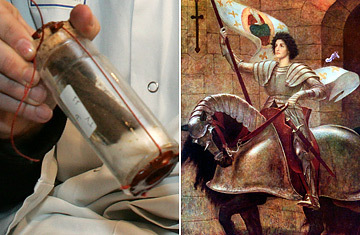 Left, the supposed remains of 15th century French heroine Joan of Arc. Right, an illustration of Joan of Arc (1412-1431) in armor, riding a horse. It might not be the Turin Shroud, but as far as myths go, this was a big one to debunk. On April 5, a French research team declared that the alleged remains of St. Joan of Arc were fake. The relics of the iconic saint  burned alive for heresy and witchcraft in 1431 but rehabilitated as a French hero in the 19th century  have been identified as the remnants of an Egyptian mummy, a small cat and scraps of wood. Discovered by a student in the attic of a Paris pharmacy in 1867, the saint's purported remains were declared authentic by the Church before being sent to Chinon in 1876. The town played an important role in the saint's life as it was at the royal court of Charles VII in Chinon where she convinced the king to send an army to defend the city of Orléans from the invading English. Leading these troops into battle, St. Joan later emerged victorious from the siege. The tests on the relics took around a year to complete and were led by Philippe Charlier, a forensic scientist at the Raymond Poincaré Hospital in Garches, near Paris. A leading figure in matters medieval and macabre, Charlier has used forensics to investigate the deaths of other historical figures. Following a series of tests in 2006 on the remains of Agnès Sorel, mistress of Charles VII, whose premature death has long been a source of historical debate, Charlier announced she had been killed by mercury poisoning. "History and forensic science are crossing paths more and more frequently," said Charlier. "Forensics now gives us the scientific means to perform autopsies on the past. As for the relics of St. Joan of Arc, our tests give conclusive proof that these aren't her remains." As well as using carbon dating and infrared analysis, Charlier employed the unusual technique of olfacation, or sniffing. In a blind test, two smell experts from French perfumeries Guerlain and Jean Patou whiffed samples of burnt wood, decomposed bones and skin, and noted the odors. "The smells weren't all horrible," says Sylvain Delacourte of Guerlain. "Some were pleasant and fragrant." The predominant scent, vanilla, indicated that the relics came from a body that had decomposed naturally; the organic compound vanillin is produced during this process. Set alight while tied to a stake (three times over, if legend is to be believed), St. Joan of Arc's body clearly didn't meet such a natural end. Sniffing is rarely used in the field of paleopathology yet such was the positive correlation between Charlier's own results and those of his team of smellers that he plans to use the technique in future investigations. Carbon 14 analysis dated the human rib contained in the relics to between the 7th and 3rd centuries B.C. Pollen testing also found traces of pine  a tree that didn't exist in medieval Normandy but whose resin was widely used to embalm bodies in ancient Egypt. The presence of the cat bones might have added weight to the relics' authenticity, as black cats were traditionally thrown on the fires that burned those accused of witchcraft in medieval times. DNA tests revealed however that the animal was of non-European origin. St. Joan of Arc languished in margins of French history before she was revived as a nationalist symbol in the late 19th Century. Having been called by God to expel the invading English from France during the Hundred Years War, as the story goes, the teenage saint was later appropriated as a symbol of the disputed province of Lorraine during the Franco-Prussian war of 1870-1. The discovery of the false relics would also have added weight to the public campaign to canonize St. Joan, launched in 1869 by the Bishop of Orléans. As for the unlikely materials used by the hoaxers, Egypt became a travel destination for wealthy French following Napoleon's expedition there in 1798. Mummies, or parts of mummies, became much sought-after souvenirs. The bogus bones look unlikely to affect the lucrative tourist industry based around one of France's most famous daughters. The Joan of Arc Museum in Chinon, where the alleged relics were previously exhibited, is set to move to new, larger premises in 2009. The new museum will house an expanded exhibition featuring previously-unseen written documents that chart the saint's tumultuous life. Despite having exhibited the remains for decades, the museum denied it was red-faced after receiving the results of the forensic tests. "Some people did think they were genuine," said former museum director Anne-Marie Salichon, "but I knew all along they were fake."